You are here: Home / Jeff's Corner / Mercury stationed direct on my Uranus! Mercury stationed direct on my Uranus! [ad]Mercury retrograde happens three times a year, yet its effects can vary widely each time. For some, a computer might need to be restarted, a trip may be delayed, or the lines of communication with a friend may be crossed. Yet at other times, significant problems — not just inconveniences — can arise. Inevitably, these cycles have the most impact when the station of Mercury makes an angle to a point in your natal chart. Any time a planet appears to change directions in the sky, it stations. This occurs every time the planet is about to go retrograde (backwards) or direct (forwards after a retrograde). The planet slows down during a station, and often hovers at a specific degree of the zodiac for days or even months (depending on how far it is from the Sun). During a station, the themes symbolized by the planet are heightened and intensified. Last Wednesday, Mercury stationed direct at 7 Libra, and it so happens that Uranus was at that degree of the zodiac when I was born. Hence, Mercury conjoined my Uranus, but because it stationed on my Uranus, it had a stronger effect than a passing transit. Needless to say, both of these were very disruptive (Uranian) events. I was “let go” yesterday. As for the server being down: I spent hours researching other web hosting companies, and came to the decision that no service will be 100% perfect. But at least I know what my options are. 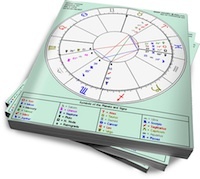 Both of these incidents are work-related, and this Mercury station affected two of my work houses: the Second House of Money (where Uranus resides), and the Sixth House of Work (with Aquarius, ruled by Uranus, on the cusp). The takeaway: The groove of life depends on a smooth flow of information. Mercury can show you where the kinks are, and it’s your job to fix the hose. Comment below: How was Mercury Retrograde for you? Ouch. Good luck going forward, Jeffrey. Looks like transiting Uranus and Saturn, with help from the Messenger, are conspiring to change your life in big ways. Wow, Jeff, I am sorry to hear about your job loss. I know that you also have Saturn transiting the 1st. I wonder if it’s just another way of pruning away the non-essentials? For me, Mercury has been hanging around my Natal Pluto at 10 degrees Libra in my 2nd house. I have given up trying to be a success at work. I am letting go and letting things work themselves out. One of my bosses came to visit last week (on the 13th)and I got the distinct impression that my efforts don’t matter anymore and that I should be looking for something new. I resisted the temptation to tell it like it is to this guy- I had transiting Mars exactly conjunct my Natal Uranus in the 3rd(in Scorpio)the day he arrived. I am curious-what other implications Mercury conjunct Pluto could have? @michelle, Mercury-Pluto could be hidden info revealed, words that destroy or help regenerate, speaking the unspeakable. @leslee, yes, big ways indeeed! Gosh, what a Mercury R that was, sorry to hear they ‘let you go’ as you said. Would Venus conjucnt Pluto, both at 3′ of Libra be near enough for Mercury to be classed as stationary direct on it? And did you mean that this theme can be affected for some weeks afer and not just for those few days? Thanks for the feedback. I never know whether I am supposed to be giving into this energy or not. I basically decided to can it, and it’s confusing, because I don’t know if I missed the opportunity to speak my mind, or if it was smart to shut up. This was the THE WORST Mercury Rx period I've ever experienced. My Uranus is @ 8 degrees Libra, so within a degree of Mercury stationing direct. I don't know if that has anything to do with it or not, but it's been awful. I'm over worked, stressed out, exhausted. I was physically injured. I broke my cell phone. My iPod was stolen…..& it doesn't seem to be getting any better even now even in this week. Putting out the happy vibes for you as I type this. The man I was dating had a change of heart as Mercury went retrograde, bang on my ascendant 23 libra. I saw him a week later, when he dumped me, but the communication went wierd when Mercury retrograded. Now having said he wanted to be friends, he won’t even speak to me. Horrible Mercury Rx that one! @Alison, I’d say 3 Libra is close enough to the station to be in effect. What I was saying in my post is that a planet during its station can stay at the same degree for days or months. The degree itself can be triggered later by another planet. Yikes Jeffrey!! I want to say good luck finding another job, but I’m sure it wont be too hard for you…your pretty dern talented! As for me I’ve had so many things going on I think the rx just made me more introspective about my relationships. I just got a freelance gig, full-time hours. Boy, that was fast! Mercury opposed my 9th house 18drg Aries Mercury as it moved backward over my 13drg 8th house Aries Sun. That week my Gemini lover whos going through hell , backed down & disappeard – not answering his phone. My Best Sagitarius girlfriend & i had a blow up ( …now my Sun sits on both their Ascendants 13 & 15 degrees Aries?!) ..and, my daughter & her boyfriend (both Leos) moved out due to a family upset. During all this , ive been offered prestigous work that will take me travelling with a sports team. Jeff, congrats & good luck…..:-) Prayers do work afterall. I have to say I’m very impressed with all the changes you’ve been going through. The new design and name change are well thought out and the menu format is quite extensive. The more negative things are stressful but I’m sure you will be looking back at this period of time with some satisfaction.